Have you ever seen a search result that comes with a little extra? 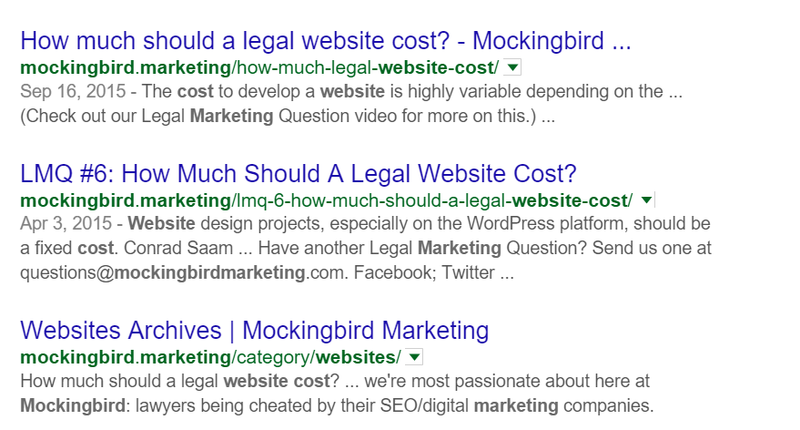 The first result for “Mockingbird Marketing” has 6 other links in addition to the homepage. On the right are our address, phone number, and business hours. Blog posts show the date they were posted on the left-hand side before the text in the search result. These “extra” pieces of information are called rich snippets, and appear when Google decides information is important enough to display directly in the SERPs. When rich snippets from your site appear in search results, they take up more space (blocking out competing search results) and increase the likelihood that a user will click to your site. Google gets the information for this by looking at your site and identifying the important pieces. While it has been pretty successful, it’s best to help Google notice your website as much as you can. We do that using structured data, essentially a way of flagging information as important (“LOOK AT ME! I AM THE ADDRESS!”). Google has documentation on what kinds of structured data it supports, but most categories aren’t applicable to attorneys (such as recipes and software apps). Three of these apply to lawyers, and we’ve included templates for them as part of a Schema “starter pack” that you can copy over to your website and fill in. This displays your business information to Google and identifies you as a legal service. This is the most important piece of Schema to use. If you get anything from this blog post, it is that you should use Schema for your business information. Previously this was the “Attorney” category, but now the official name is “LegalService”. If you are attending, speaking at, or hosting an event. Marking up videos helps Google understand what information is associated with a video, and can help your videos show up in search results. If you’re interested in expanding your knowledge of Schema, you should look into some other categories and check out some of the tools we’ve found useful. How do you use Schema? Have any success stories? Let us know in the comments! Nice information, I have applied all the above schema for one of my attorney client but still things are not in our side.